I have spent some time creating PowerShell scripts to solve all my installation and upgrade tasks. 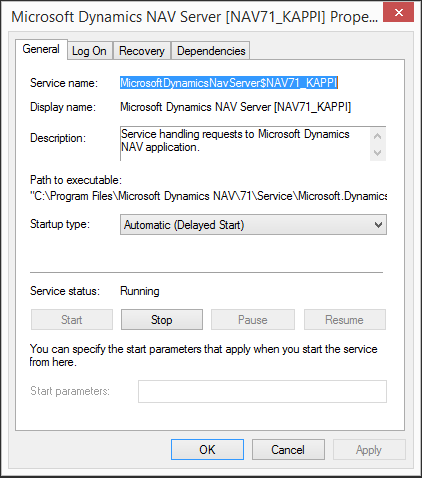 I am now able to install Dynamics NAV on both local and remote computers. I can install databases, services, clickonce distribution and web clients. And my final task last week was to be able to install knowledge base package in a few minutes that upgrades services, client, webclient and clickonce. Likely to create a blog about that later. 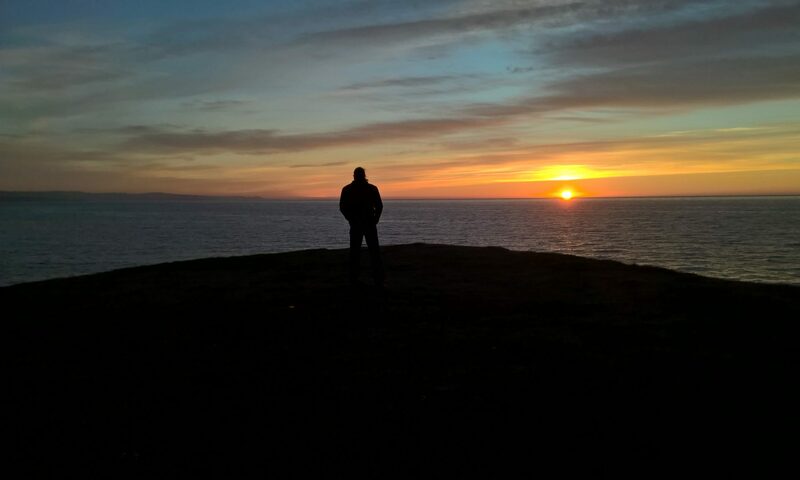 As a part of this process I have created several PowerShell scripts and functions. I will find a time to share this with you over the next weeks. For now I would like to share one function. When you install a NAV Service Instance from the DVD the service startup is set to “Automatic (Delayed Start)”. There is a reason for this. I have seen servers unable to finish the startup process if the service startup type is set to “Automatic” only. There is a period of time needed before the service can start after the computer startup. The problem I am facing with my scripts is that the command New-NAVServerInstance will leave the service in “Automatic” startup mode. I wanted to change this so I created a function. Write-Host "$Computer : Failed to set $Service to delayed start. I added this function to my New-Instance script and call the function after the service has started. 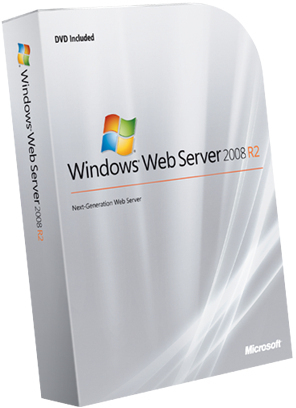 I was going through my shelfs and found a Windows Web Server 2008 R2 . Since I moved my web sites to Azure I am not using this license any more. Do you want this DVD and License ? Or just the License ? You can install NAV Server on this version. Everything will work except the NAV Help Sever. NAV Help Server requires Windows Search Services that are part of the File Sharing Role and that role is not included in Windows Web Server 2008 R2. In November 2010 I blogged about Transferring small amount of data between databases. There I had a Form that can read and write a XML file with table data. This Form was used frequently in my company to move data between companies and databases. The good thing about this method is that I can move data between database versions. Yesterday I got a request to share a NAV 2013 R2 version of this solution. Here it is ! This version includes support for BLOB data in the tables. BLOB data is converted to Base64 and included in the XML file. Be careful when importing. Existing data will be overwritten. In NAV 2009 R2 I did a solution that used ClosedXML to create Excel Documents. ClosedXML is built to give an easy access to the office documents and is built on top of the Open XML SDK 2.0 for Microsoft Office. I upgraded this solution to NAV 2013 without any problems. Then to NAV 2013 R2 and there is where the problem started. With NAV 2013 Microsoft changed the way NAV creates Excel documents. They move away from the old COM model to this Open XML method. You can see the changes in Table 370 Excel Buffer. In NAV 2013 Microsoft used version 2.0 of the Open XML SDK. In NAV 2013 R2 Microsoft is using version 2.5 and that is where my problems started. When trying to save the Excel document with the SaveAs function I got a SmartTag error. I searched and found that the SmartTags are discontinued in version 2.5 but they are still used in ClosedXML. As usual there is a solution and I found it on the Closed XML forum. For some reason it does not work for that way for “ClosedXML_Net3.5” project. I opened my NAV 2013 R2 Developement machine with Visual Studio 2012, opened the solution and removed the ClosedXML_Net3.5 project. Then replaced all references to Document.OpenXML with the pre-installed version 2.5 – yes the version 2.5 is installed with NAV Server. The new ClosedXML 0.69.1.0 was built and it works with OpenXML 2.5 and I can now do the upgrade from NAV 2013 to NAV 2013 R2. I just upgraded my home network to Windows Server 2012 R2, Exchange 2013 and Office 2013. I use the Essentials Role on my primary domain controller to handle the home computers. 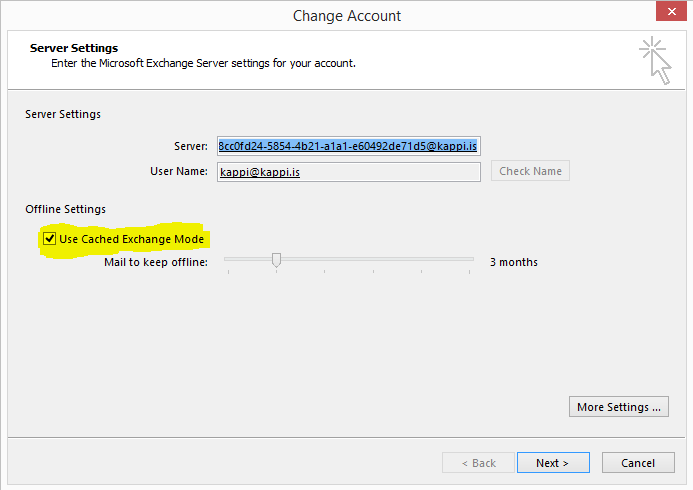 I have a few email addresses and I wanted to pull them into my Exchange folder via POP interface. So – I added two POP accounts. Then the strangest thing happened, the mail I got through the POP accounts all appeared as Draft and ready to be sent. With the email coming in this way there is no way to forward or reply to the message. 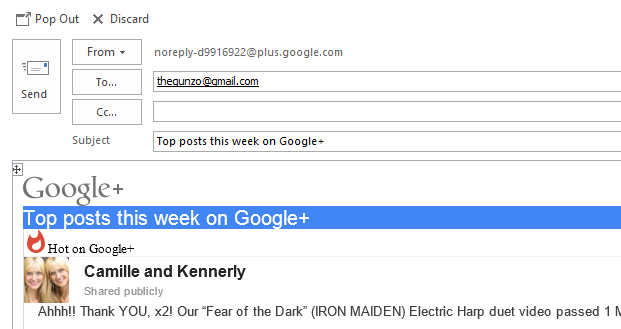 I looked for the solution and found posts like this: Emails as draft on inbox web apps and locally but they did not help. The solution is simple but the functionality is questionable to say the least. Just make sure that your exchange account is using cached mode. 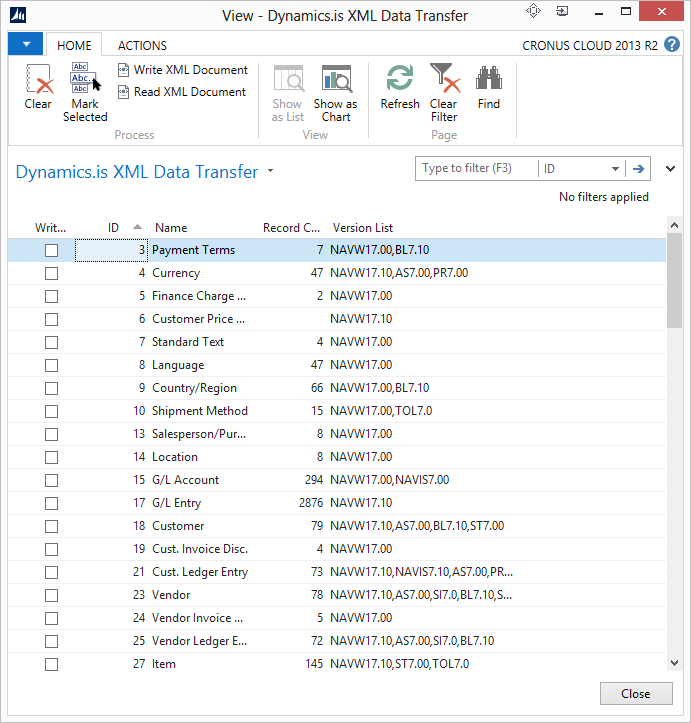 In my earlier posts I showed how to create the databases and how to install Dynamics NAV on the server machines. The next step is to create an instance for every application and mount the default tenant. The default tenant is the only one that will be able to change the application data. To finish this demonstration I will show how I mount an empty tenant database and create a new company with clickonce installation for windows client and an active web client. With these setting I can create the instance remotly and change the settings to multitenant. Write-Verbose "Creating remote PS session on $NAV_RemoteMachineAddress…"
Write-Verbose "Done creating remote PS session on $NAV_RemoteMachineAddress." Write-Output "The NAV Server virtual machine is: $NAV_RemoteMachineAddress"
Write-Output "The NAV Server Instance is: $ServiceInstance"
Write-Output "The NAV Server account credentials: $NAV_WindowsServiceDomain\$NAV_WindowsServiceAccount/$NAV_WindowsServiceAccountPassword"
I also activate the JOBQUEUE NAS function by default. 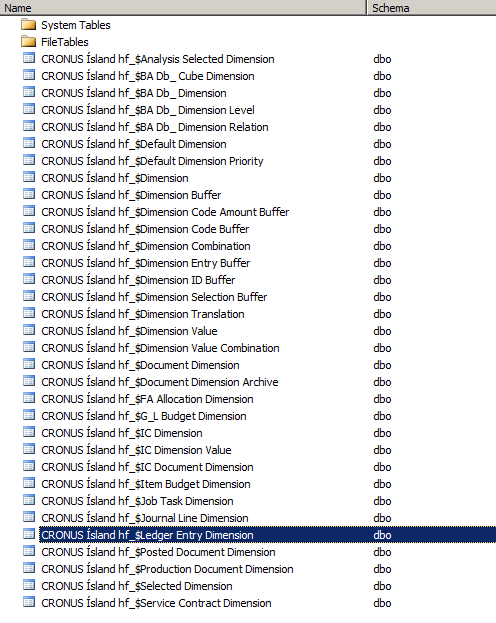 I use the CRONUS database as the default tenant and that is the only one with write access to the application database. My next step is to mount the application and the default tenant and add required users to the default tenant. Write-Verbose "Creating remote PS session on $NAV_RemoteMachineAddress..."
Write-Verbose "Mount Application to $ServiceInstance..."
Write-Verbose "Mount Default Tenant to $ServiceInstance..."
$fullUserName = $NAV_WindowsServiceDomain + "\kappi"
Write-Verbose "Mount Tenant $tenant to $ServiceInstance..."
Write-Verbose "Done Mounting Tenants to Server Instance $ServiceInstance on $NAV_RemoteMachineAddress." If something when wrong I can use this script to remote the instance and try again. Write-Verbose "Removing Server Instance $ServiceInstance..."
Write-Verbose "Done Removing Server Instance $ServiceInstance on $NAV_RemoteMachineAddress." All the framework is installed and running. Now it is time to prepare the system for my first client. I create a folder for each client and in that folder I put the Set-TenantSettings.ps1 file. $applicationName = "Microsoft Dynamics NAV 2013 R2 for $NewCompanyName"
Now I am all set to mount my first tenant and create the first company. This script will also create the users needed for the tenant. All set and now to create the client distribution with clickonce. Write-Verbose "Creating a web site that holds a ClickOnce deployment of the Windows client on $NAV_RemoteMachineAddress..."
Write-Verbose "Creating new ClickOnce web site for server instance $ServiceInstance at address $webSiteUrl..."
Write-Verbose "Creating new web site $WebSiteName on port $Port, pointing to $PhysicalPath…"
# Put a web.config file in the Deployment folder, which will tell IIS to allow downloading of .config files etc. Write-Verbose "Done creating new web site $WebSiteName on port $Port, pointing to $PhysicalPath." Write-Verbose "Done creating new ClickOnce web site for server instance $ServiceInstance at address $webSiteUrl." Write-Output "The Windows Client can be downloaded via ClickOnce at: $webSiteUrl"
And finally the web client. Write-Host "Creating Web Site " $WebServerInstance " ..."
I am using the URL rewrite method in IIS and that has to be enabled. See this post from Microsoft on how to do that. The next task is to create the required scripts that will install the client and the server updates and update the clickonce distribution. This will be posted later.